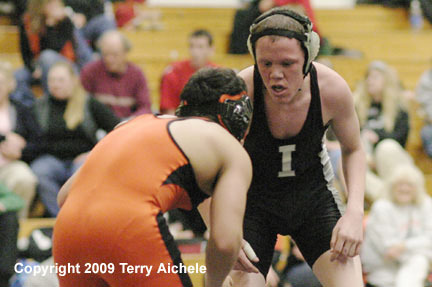 James Martin of Irrigon grimaces while being pressed down by Dakota Smith of Bonanza during a 135 pound match on Saturday. 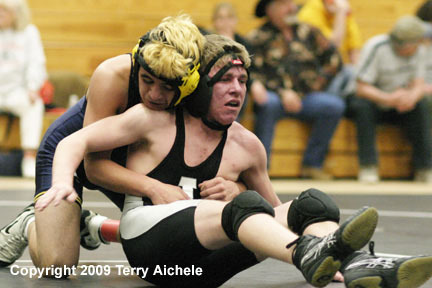 IRRIGON - Championship action of the OSAA District III 2A Wrestling Tournament took place Saturday, February 21, 2009 in Irrigon. Wrestlers from Bonanza, Chiloquin, Culver, Gilchrist, Irrigon, Lakeview, and North Lake took part in the two day tournament. 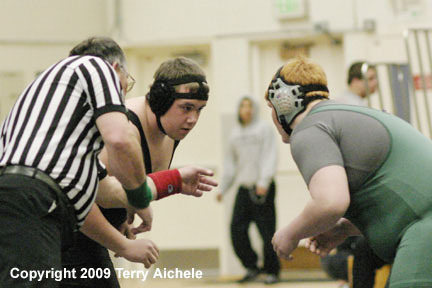 LEFT - Dakota Sheppard of Irrigon, in black and grey, sizes up Bradley Toombs of Gilchrist, in green, during a 275 pound match on Saturday. 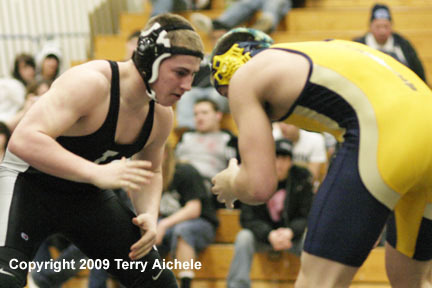 Sheppard won with a pin. RIGHT - Rosario Rios of Irrigon, in black and grey, reacts to a move by Jesus Retano of Culver, in orange, during their match on Saturday. Rios won the match. LEFT - Rosario Rios of Irrigon in black and grey, wraps up Jesus Retano of Culver in orange. 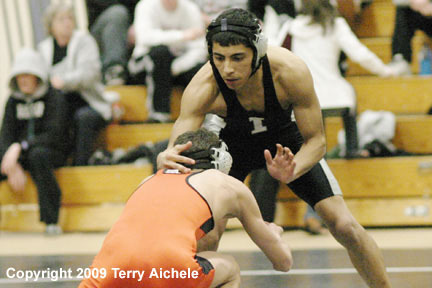 RIGHT - Jesus Retano of Culver in orange, is above Rosario Rios of Irrigon, in black and grey. 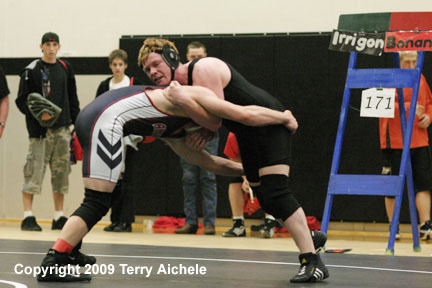 LEFT - James Martin of Irrigon circles around a Culver wrestler in a 135 pound match. RIGHT - James Martin of Irrigon, on the right, prepares to lunge at Dakota Smith of Bonanza. 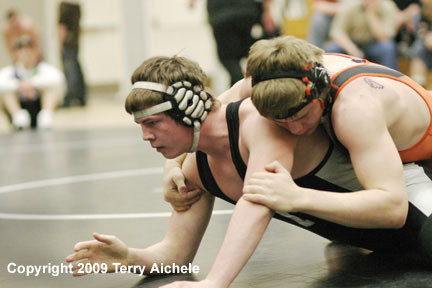 LEFT - James Martin of Irrigon presses Dakota Smith of Bonanza down to the mat. 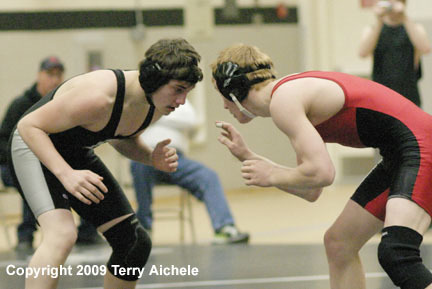 RIGHT - Jace Hendrin of Irrigon, in black and grey, circles Talon Guthier of North Lake. 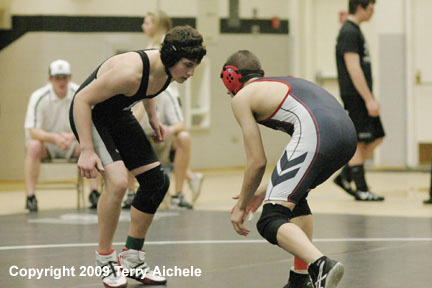 LEFT - Kyle Sullivan of Irrigon, in black, lines up with Bebo Clark of Chiloquin in a 160 pound match. 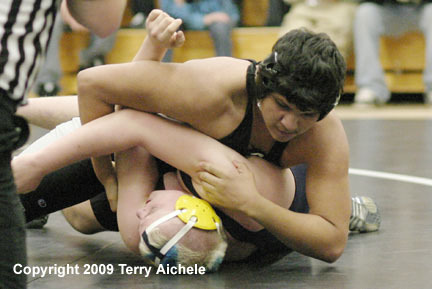 RIGHT - Raphael Ramos of Irrigon, in black, gets Jamie Painter of Gilchrist in a headlock during their 215 pound match. 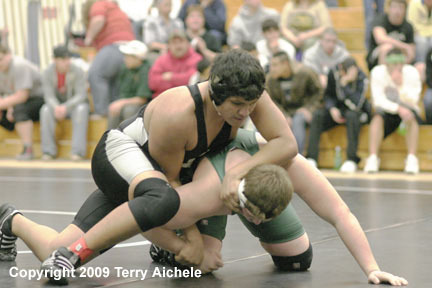 LEFT - Raphael Ramos of Irrigon, in black, works at rolling Jamie Painter of Gilchrist during their 215 pound match on Saturday. RIGHT - Raphael Ramos of Irrigon, in black and grey, puts pressure on Jamie Painter's shoulder to drive him down into the mat. 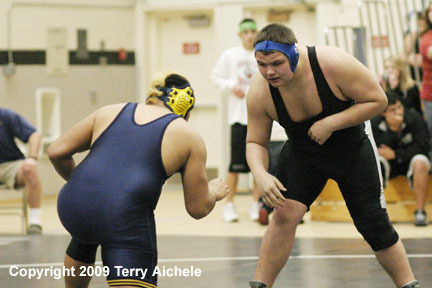 LEFT - Harry Abercrombie of Irrigon on the left during his 285 pound match with Javi Martinez of Lakeview. 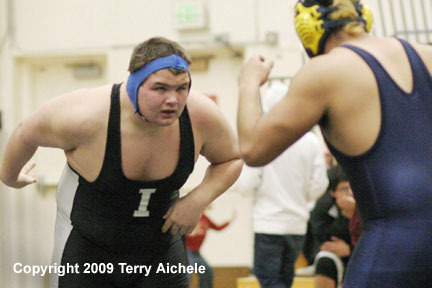 RIGHT - Harry Abercrombie of Irrigon on the right during his 285 pound match with Javi Martinez of Lakeview. 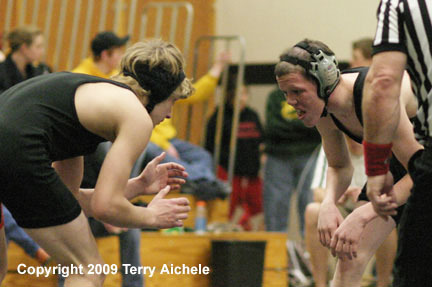 LEFT - Jace Hendrin of Irrigon on the left, during the match with Mike VanHorn of Bonanza in a 140 pound match. 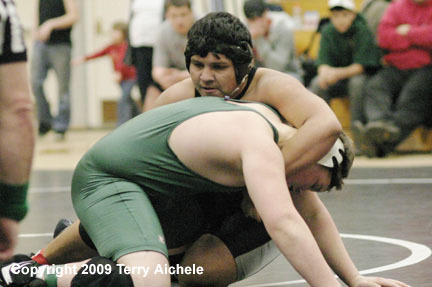 RIGHT - Rafael Ramos of Irrigon attempts to roll his challenger over. 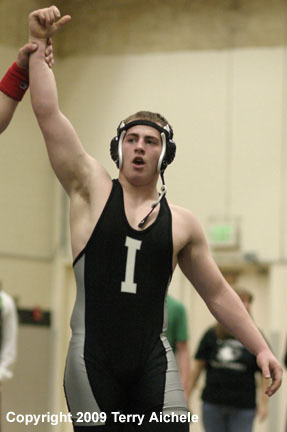 LEFT - Giles Ellett of Irrigon has his hand raised in victory by the referee following the championship match in the 171 pound class. 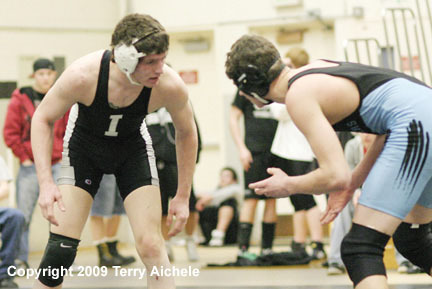 RIGHT - Mike Oliver of Irrigon, in black, locks up with Clint McGilvray of Bonanza in their 171 pound match on Saturday.